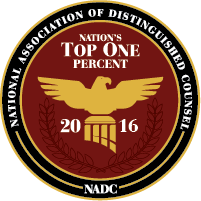 » Selected for inclusion in The Best Lawyers in America® 2012, 2013, 2014, 2015, 2016, and 2017 in the field Criminal Defense: White Collar, with subspecialties in Tax and Tax Evasion Defense. » Selected for Inclusion to Super Lawyers 2009, 2010, 2011, 2012, 2013, 2014, 2015, 2016, and 2017 Editions in the area of White Collar Criminal Defense. » Law Intern to the Honorable Henry Bramwell, United States District Judge for the Eastern District of New York. » Law Clerk to the Honorable Dickinson R. Debevoise, United States District Judge for the District of New Jersey. » Accomplished Martial Artist with Black Belt Rankings Achieved in both Japanese and Okinawan Karate.